Material handling around a construction site demands a great deal of flexibility which a skidsteer loader can provide. 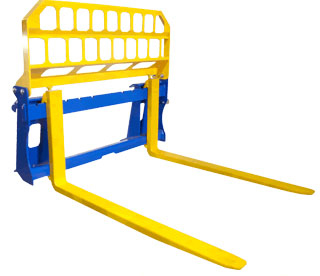 Heavy duty construction, the precision mounting plate and various other ingenious features make our Pallet Fork attachment a ‘must have’ item. Large range of tyne options up to 2000 Kg’s are available (Other tyne sizes are available – please contact your agent for further information). Fully adjustable tynes with locking pins. Tynes are fixed at the top and heel preventing bouncing while carrying loads. 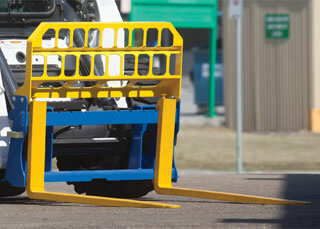 High visibility brick guard giving you good vision whilst loading and unloading – crucial in a safety conscious age.